How Does LA Measure Up To National Foreclosure Rates? Black Knight Financial Services, which provides technology, data and analytics for lenders and servicers, released its “Mortgage Monitor” for April 2016. Here’s how Los Angeles is comparing to the rest of the country. California as a whole remains well above the national average. The total number of non-current loans in the state was 3.4 percent, down 10.2 percent year-over-year. The total number of delinquent loans in the state was 2.9 percent. For Los Angeles specifically, Black Knight noted that home price appreciation has decelerated somewhat, but the share of cash purchases for high-end homes was 39 percent, the highest on record. 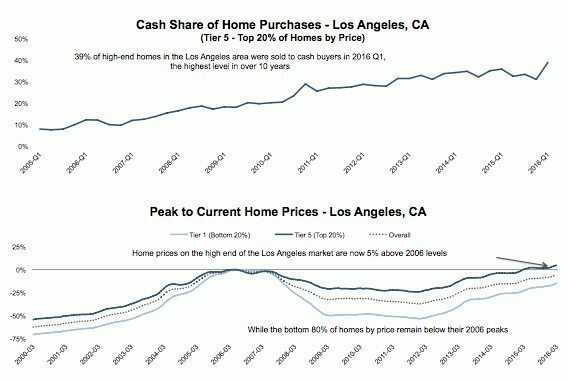 “Cash demand may be helping to fuel home price recovery in higher-end Los Angeles communities; Tier 5 properties are now 5 percent above the 2006 peak, while lower price tiers are still 3-15 percent below peaks,” stated the report. The city is still 6 percent off its 2006 price peak overall; homes in the lowest tier are 15 percent below peak.